Son of Thomas, earl of Arundel, England. Grandson of Saint Philip Howard. Raised Catholic in England in a time when the faith was being persecuted. Married Mary Stafford in 1637. Viscount of Stafford in England. 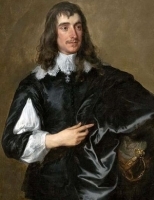 Baron Stafford in 1640. Exiled in 1642 for political reasons, and lived in the Netherlands. Undertook diplomatic missions in Flanders and Switzerland for Emperor Ferdinand. His family was impoverished when the English Parliment impounded his lands. Arrested in Heidelberg in 1653 and Utrect in 1656 for apparently political reasons, but he was acquitted of all charges. In 1660 his family property was reinstated, the fortunes of his family turned around, and they returned to England. Accused of complicity in the "Popish Plot", he was sent to the Tower of London on 25 October 1678. Imprisoned for two years before they bothered to try him, he was condemned before the trial started. Though he had no involvement in the "Plot", he was martyred for being an influential, high-profile Catholic. Merovingian courtier. A married layman, he made financial arrangements for his wife, who may have later become a nun, and left the court of King Childebert I to become a monk at Deux Jumeaux abbey. He and a small group of brothers left to become hermits in the nearby forest of Ouche. Ebrulf converted a band of highway robbers to the faith. With them, the brothers, and some spiritual students who gathered around them, he founded a small monastery near Ouche, and served as its abbot. It emphasized self-sufficiency for the house, manual labour offered to God for the men, and was so successful that several other small houses were founded nearby. Son of Jesse, and a shepherd in his youth. Anointed by the prophet Samuel. During war with the Philistines, David, relying on God, slew the giant Goliath and won the friendship of Jonathan, son of Saul; courtier. Married to Saul's daughter Michol. Forced into exile for political reasons. Married to Abigail.When Saul and Jonathan fell in battle, David was chosen King of Judah and Israel; he reigned for 33 years. Founder of the Judean dynasty at Jerusalem. National hero as a youth, soldier, reformer, father, prophet, musician, poet, hymnist, writer, sinner, and penitent. See 1 and 2 Kings, 1 and 2 Samuel, 1 and 2 Chronicles. Educated by the Sisters of Mercy in Enguera, Spain; the Pious Schools in Valencia, Spain; the College of Saint Joseph Valenza; and the Seminario Conciliar Center. Ordained a priest in the archdiocese of Valencia on 17 June 1916. As a parish priest he was known for his work with children, establishing Eucharistic associations, and spreading the Forty Hours devotion. Co-adjutor of San Maria de Oliva in 1917, treasurer of Benifallim in 1920, pastor at Luchente in 1921 where he established Eucharistic devotions that led to annual mountain retreats. Martyred in the Spanish Civil War. Marcellus inherited a large fortune in his youth. Studied at Antioch and Ephesus. Monk and abbot of the Eirenaion monastery at Constantinople. The monks of these houses were called Akiometoi (= sleepless) because they organized in groups that rotated singing in chapel so they were singing God's praises 24 hours a day. Under Marcellus, his became the most influential of such houses. In 465 Constantinople was threatened by destruction by fire; Marcellus's prayers are credited with saving the city. In 488 he attended a synod called by Saint Flavian. Participated in the Council of Chalcedon. Layman in the archdiocese of Valencia, Spain. A telegrapher (telegraph operator) on the ship "Buenos Aires". Lawyer. Secretary of the Union of Rural Police. He used his legal skills for the poor, working for legal aid. Member of Catholic Action. Member of Nocturnal Adoration. A pious man, he went to Mass daily and taught catechism. Jounalist. Married to Francisca Bosch Pieva on 22 April 1935. Arrested on 3 September 1936 for being a faithful Christian, he was martyred in the Spanish Civil War. Born to the Italian nobility. Cared for his mother until her death, then became a hermit for several years on Mount Etna, Sicily. Franciscan lay brother. Cook for Franciscan house. Known for his childlike simplicity, and the many graces that derived from it. Studied at the cathedral school in Rheims, France; student of Gerbert of Aurillac, who would later become Pope Sylvester II, and of Saint Fulbert of Chartres. Benedictine monk at Lagny, diocese of Meaux, France. 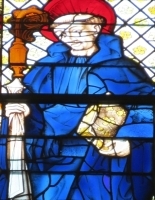 Abbot of Saint-Arnoul Abbey. Abbot of Fontenelle Abbey where his efforts at reform led to his murder by an unruly monk. Ninth-century Scythian slave. Relative of Saint Theodore Studites. Freed from slavery, Thaddeus became a monk. His house was dispersed in the iconoclast persecutions of Emperor Leo V. Thaddeus was arrested with several brother monks, ordered to reject icons and images, and to trample on an icon of Christ; he refused. Martyr. Mercedarian. Missionary to Chile in 1569. Worked in Ecuador and then in Cusco, Peru, working from the Mercedarian convent there. Martyred by pagan natives while preaching. Bishop of Milan, Italy in 423. Attended the Council of Ephesus. Fought the Nestorian heresy that denied that Mary was the Mother of God. Bishop of Vaga (modern Béja, Tunisia). Part of the Council of Carthage in 256. Several of his letters have survived to today. Martyred in the persecutions of Valerian. Monk and teacher at the monastery of Clonard, Ireland. Rector in 650. Noted scholar and master of Greek and Latin. Wrote several theological treatises and biographies of Saint Brigid, Saint Fechin and Saint Patrick. Seventh century courtier. Disenchanted with the worldly life, he lived for a while as a hermit. Founded the abbey of Gambron-sur-l'Authion, France, which simultaneously used the Rules of Saint Benedict and Saint Columbanus, and served as its first abbot. Bishop of Bourges, France for 20 years. Known for his intense spiritual life, and his work to enhance the spiritual life of his flock. The town of Saint-Florent-sur-Cher is named for him. Married lay woman, and a mother. Martyred with her husband and son, whose names have not come down to us, the persecutions of Valerian. Gentile first century convert. Missionary with Saint Paul. Pilgim to Jerusalem where his Gentile presence in the temple stated a riot. Dominican lay brother in Seville, Spain. Miracle worker and healer. When he was in charge of giving bread to the poor, the bins never ran empty. A group of Christians executed together for their faith. The only details to survive are eight names - Crescentius, Dominic, Honoratus, Lybosus, Primian, Saturninus, Secundus and Victor. A group of Christians executed together for their faith. The only details to survive are three names - Boniface, Callistus and Felix. 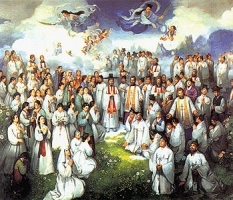 A group of seven lay woman in the apostolic vicariate of Korea who were martyred together.